Join a gay group trip and sail around the most beautiful islands of The Carribean. Enjoy some tropical designer shopping at Gustavia and sail around the beautiful bays of St. Martin. You’ll sail the reefs of Prickly Pear Cays, scuba dive in the crystal clear waters and even try some fishing – best of luck. The Carribean is one of the most beautiful parts of the world. Sailing from island to island over eight days is an ideal way to discover it. This is, incidentally, a clothing optional cruise. Our Caribbean cruise begins in St. Martin. It’s only an hour from the airport to the yacht. Boarding begins at 5:30 pm. After breakfast we’ll sail to St. Barth’s and anchor for lunch at the tiny island of Ile Fourchue – the only inhabitants are goats! We’ll spend the evening in the bay of Gustavia town and have dinner there. St. Barth is distinguished by white sand beaches and excellent shops – leave some space in your case if you love designer swag. Browsing around Gucchi in a tropical setting is quite an experience. 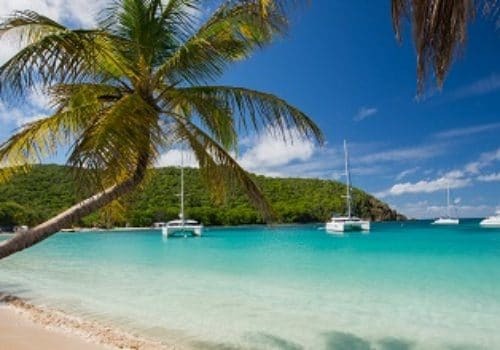 We’ll sail to Anse du Colombier in the afternoon and scuba dive for rays and sea turtles. You can join a pre-sunset hike through tropical vegetation to the north of the island. We’ll have a BBQ in the evening. This morning we’ll sail to Grand Casse, an idyllic bay with plenty of bars and restaurants. Once a week there is a local market and Carnaval. On our way to Anguilla we’ll anchor at Road Bay. Here you’ll find crystal clear water to swim in and excellent local seafood at the restaurant, The Pumphouse. We’ll sail through the reefs on our way to Prickly Pear Cays. It’s an ideal spot for scuba diving! We’ll anchor at Sandy Island and spend the night at Crocus Bay. Tonight we’ll dine at the celebrated restaurant, D’Avida. On our last day we’ll sail past Anguilla to Saint Martin. We’ll get a chance to try some fishing – see if you can catch a tuna. We’ll spend the night in Anse Marcel. After breakfast, we’ll sail to the Marina at Marigot. Say goodbye to your fellow sailors and head to your next destination.